DustChek dust control environment friendly OHS compliant, simple to use dust suppression. DustChek is suitable for mining, container yards, access roads, vineyards, hardstands, quarries, sub-division works and more. 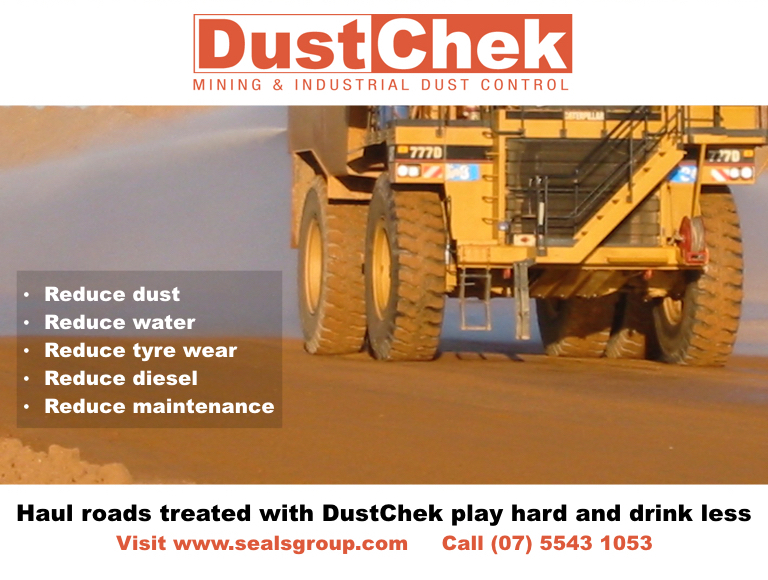 DustChek is an Australian made dust control agent that reduces dust on mining and industrial roads where there is an ongoing watering program in place. Also used for dust and erosion control on stockpiles, rom pads and open areas, the application of DustChek enables water savings of up to 90% and improved traction, whilst reducing maintenance requirements and delivering substantial savings to haul fleet operations as a result. DustChek is environment and OHS compliant. Thousands of dollars are spent on haul road construction to ensure stability and reliability for haul traffic but sadly the effort often falls short of really producing a durable finished product which delivers the best result. Continual dust problems coupled with a constant need for surface course maintenance are a major cost to miners, not to mention the increase in tyre wear as the surface of haul roads is over watered and re-graded and re-shaped constantly by water carts and maintenance crews. There is an answer to this problem: it is simple and very cost effective. Improve the strength and flexibility of the wear course. DustChek is delivered in granular form in 2Kg packs and the pure simplicity of its use is the reason for its sudden rise to fame. The process is not new but had simply been forgotten amongst the throng of technical advancements in road building and maintenance machinery. Simplicity and tried and true techniques are the key. DustChek will deliver a tight surface with flexibility and a strong resistance to water and requires only the use of on site equipment for application. A surface course with these qualities has all the obvious advantages. The process uses in situ material and will produce a same day result. Hauls roads treated with DustChek require far less watering and the maintenance level is reduced in proportion as is down time due to rain events. Contact us for details on how we can assist with your haul road problems.